20% Off Mattresses with Same Size Bed Orders at Oak Furniture Land Simply buy a bed of the same size and you can get 20% off the price of your mattress! Free Accessory with Orders of £1,500 or More at Oak Furniture Land Choose a great free lamp, mirror or clock when you spend £1,500 or more at Oak Furniture Land. 20% Off Footstools with Sofa or Armchair Orders at Oak Furniture Land Get 20% off a new footstool when you buy an armchair or sofa from Oak Furniture Land. £100 Off Selected Original Rustic Range Orders at Oak Furniture Land This range is not only stylish and functional, its also incredibly priced! But be quick, deals like this don't hang around for long. Find £100 Off Furniture Orders in the Clearance at Oak Furniture Land Check out the great discounts available in the furniture clearance at Oak Furniture Land. Shop 30% Off Sofas in the Spring Sale at Oak Furniture Land - Don't Miss Shop the range and save 30% on your new sofa this spring at Oak Furniture Land. There are many reasons why Oak Furniture Land has such a good reputation. The excellence of its furniture certainly plays its part: with a huge selection of oak, mango and mahogany products, all 100% solid hardwood and a guarantee of no particle board or MDF used, you can be sure of quality when you buy. With 20 exclusive ranges that take in a variety of designs, you'll find something to lift every room in the house: be it a bed, chest of drawers, coffee table, TV cabinet or armchair to name a few. You can shop by room, range or product to ensure you end up with the piece you want. Furniture is delivered complete and ready, so there’s no standing over a pile of miscellaneous parts scratching your head, you can get to enjoying your new furniture straight away. If you’re ordering for a new house, you can take advantage of its Home Movers Promise that lets you lock in today’s sale price for delivery to your new place on a date of your choosing. Where is my nearest Oak Furniture Land? Check out the list of stockists here. Are there finance options at Oak Furniture Land? Yes, if your purchase is over £500, you may be eligible. See here. Can I get free delivery at Oak Furniture Land? Yes, free delivery is available on all orders. Items will be delivered to a room of your choice. Full details here. Before delivery: If you cancel your order less than 2 working days prior to delivery you will be liable for a £39 fee plus return charges. Wardrobes have a return fee of £100 per item. After delivery: You have a 7 day (14 if purchased online) period to cancel your order without charge except for returns cost. Items must be in the condition in which they were received and in the original packaging. Mattresses are excluded unless they are unopened and in the original packaging. Sofas, armchairs and footstools are made to order and thus excluded from the 7 (or 14) day returns policy. You want the best for your home, so why settle for anything less with your wooden furniture? Oak Furniture Land’s products are all designed in-house, manufactured with 100% solid hardwood and beautifully finished to exacting specifications. An Oak Furniture Land discount code could save you money on your next order so you could get premium wooden furniture for less. With pieces suitable for every room in the house, fill your home with the highest quality furniture today. 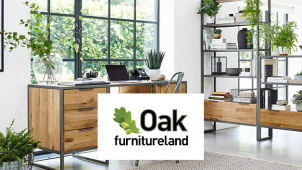 Oak Furniture Land has made quite the splash in the lifestyle industry, having been featured in high-profile publications such as House Beautiful, Good Homes and Home Style. In 2016 it won the much sought after Loved by Parents Award for its nursery range and has featured in The Sunday Times Fast Track 100 for 5 years, a mark of the growth and success it has enjoyed in this buzzing industry. Sideboards aren’t just a style of facial hair, but an elegant, versatile piece of furniture for any room in the house. Great for storage and display, they’re a fine fusion of style and utility. An Oak Furniture Land voucher could save you money off your next sideboard, getting you a stunning accent piece for less. The selection of oak and mango sideboards, all made from 100% solid hardwood, can transform any space whilst still being a great storage facility.